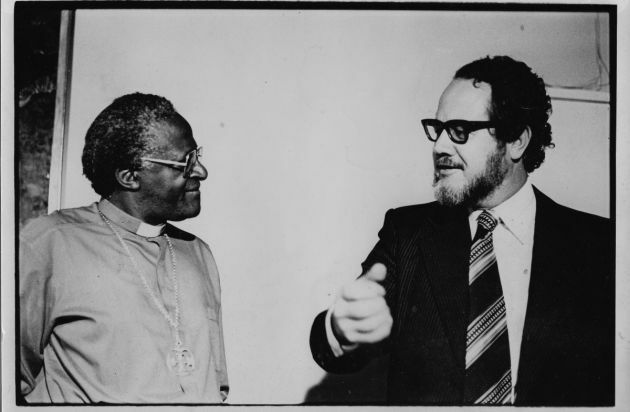 (Photo: South African Council of Churches)Former South African Anglican leader, Archbishop Desmond Tutu, who won the Nobel Peace Prize in 1984, interviewed by South African journalist Hennie Serfontein in the 1980s. Dutch television is debuting a penetrating insight into the last years of apartheid through the documentary "Our main in South Africa" (Onze man in Zuid Afrika.). The focus of the documentary film is Hennie Serfontein, a dissident South African journalist from the once dominant Afrikaner community that was at the forefront of the apartheid ideology. Serfontein came from a prominent family in the Afrikaner community, the majority group among the white minority, who forged apartheid after their war against the British at the turn of the 19th and 20th centuries. Hennie Serfontein, who is now aged 82, is a qualified lawyer but chose instead to become a journalist and take on the apartheid establishment in his writing and filming. The film is screening on Dutch TV channel NPO2 and filmmaker Anli Serfontein, Hennie Serfontien's daughter says, "It's a homage to a type of journalism practised in the 1970's and 80's in both South Africa and The Netherands In 1978." Berlin-based Anli Serfontein says, "The documentary film focuses on how the Dutch TV channel IKON, and its correspondent Hennie Serfontein, produced influential and intimate TV journalism about South Africa during the apartheid years." It illustrates the role that the South African Dutch Reformed churches played in supporting apartheid and how Serfontein exposed that in his fillms and writing. IKON (Interkerkelijke Omroep Nederland) is a Dutch public broadcaster which makes radio and TV broadcasts on behalf of seven mainly Protestant church communities. The secretive Afrikaner Broederbond sought to dominate the South African political landscape from the outset in 1918. It influence was most powerful after the National Party came to power in 1948 transforming racism from a practise to an ideology. The Broederbond played a pivotal role in influencing the apartheid ideology at one time known as Christian nationalism. This was the cornerstone of the National Party of South Africa and apartheid reached its zenith under leaders Hendrik Verwoerd and John Vorster in the 1960s and 1970s. The Broederbond was a secret society made up of key officials in the judiciary, education, armed forces and the police whose proposals drove the racist policies of South Africa. The exposes of Serfontein in South African Sunday newspapers and those of Wilkins and Strydom revealing names of Broederbonders and their policy proposals embarrassed and angered the government and the Afrikaner establisment. Serfontein left the Rand Daily Mail and the Sunday Times and became print, radio and television correspondent in the turbulent 1980s for Dutch television and other media. Max du Preez, a legendary dissident journalist from the Afrikaans community, who edited Vrye Weekblad (The Free Weekly) pays tribute of Serfontein in the film describing him as a "crusty speaker to the truth of power. He reached into the heart of Afrikanerdom." Sometimes overstepping the line from journalism to activism, Hennie Serfontein's reports and portraits gave Dutch audiences rare insights into the perfidious inner workings of apartheid. They also highlighted the lives and deeds of many of the central figures in the anti-apartheid struggle, such Winnie Mandela, who was Nelson Mandela's wife while he was imprisoned, Allan Boesak (former president of the World Alliance of Reformed Churches, and two former South African Council of Churches leaders Frank Chikane and Beyers Naudé. "This film is a homage to both Hennie's unique style of journalism that resulted in some very intimate portraits of anti-apartheid leaders of the time and to IKON, the broadcaster where I learnt my documentary trade," Anli told Ecumenical News. "Both deserve acknowledgement for some brave journalistic choices they made. It was ecumenical broadcasting at its best. Kenmerk was in the forefront of critically examining oppressive societies and urging the churches in The Netherlands to join them. Hennie Serfotein's films were shown in "Kenmerk," an IKON program that soon became the most knowledgeable source in the Netherlands on developments in South Africa, and had significant influence on public opinion. "Our Man in South Africa" is in English (about 50 percent), Dutch and Afrikaans.